Does your company accept credit card information from your clients? Do you have personal information for your clients such as Social Security Numbers or Banking information? Do you have a data base of contact information? All of these are items that a computer hacker can access or worse, steal. Are you protected against such a terrible act? Cyber Liability coverage is one of the fastest growing coverage's in the United States. Computer hackers are gaining entry to large corporations down to 1 man operations. Call TriState Business Insurance today to discuss the protection against cyber crimes. We work with insurance companies that specialize in this type of insurance if a data security event were to occur, and in the case of helping you handlethe situation swiftly. This starts with a Loss Mitigation service by providing tools & resources to address and gauge key areas of cyber security risk before an event occurs. Then the Incident Response Service is comprised of teams of experts in the legal, computer forensics, notification, call center, public relations fraud consultation, credit monitoring and identity restoration service areas to help limit exposure to a loss when an event occurs. Don't let a Data Breach shut your company down. 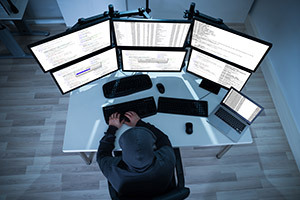 Call TriState Business Insurance today to discuss how we can protect your business from computer hackers.